Initially, I was skeptical when the rebooted Mighty Morphin Power Rangers film was announced. It seemed that even though the series is still running, 24 years later I might add, that this new movie would be a soulless cash grab aimed to pluck that nostalgia string that producers are all too conscious of. So, it is surprising that 2017’s Power Rangers defies quite a few expectations, in that it may not just be a great Power Rangers film, but a teen movie headed by some surprisingly well-executed characters. Directed by Dean Israelite, previously known for his time-travel picture Project Almanac, the film follows a new group of chosen teens as they must defeat the evil Rita Repulsa and learn the power of friendship. The inherent cheesiness is dialed down from the original show and, in spite of several off moments, the film sticks to a grounded and worldly take on its protagonists. 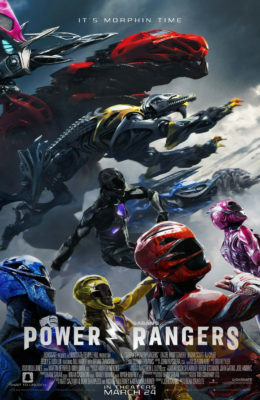 Each of the Rangers comes across as unique and interesting, with Naomi Scott and RJ Cyler as the pink and blue Rangers being relatable and varied in a way that I thought would never occur in a movie where robot dinosaurs fight a giant, gold hawk-monster. The greatest feat that the film pulls off is in its first John-Hughes-inspired act, where each of the characters is displayed and developed to be more than just the fighter or the brain, but as actual people. Yet, the film is definitely not without its faults. From seemingly undercooked CGI to a rushed last act, the film seems out of place this early in the blockbuster season. This is evident in the editing, which goes from fairly well-structured and clear to confusing choices (Rita’s camera shake whenever she enters a scene?) that give an odd tone for the last half of the film. It’s a movie that seemingly doesn’t want to choose what kind of movie it wants to be, as it transitions from teen film to blockbuster without looking back. The moments of childhood glee bubble up from time to time, with one particular music cue eliciting some fist-pumping, air guitar awesomeness. But, I do think that a director with a clearer vision, or perhaps a loosening of creative control would have shaped Power Rangers into a film of more bombast and energy than what was put into theatres. It must also be noted that parts of the film were shot in Kamloops and surrounding area and dang, they actually looked pretty rad.